Abdominal pain is common. Severe pain or pain that is associated with red flags should be discussed with your doctor right away. An urgent office visit or even an emergency room visit may be necessary depending upon your specific complaints. Red flags that should prompt discussion with your doctor include fever, diarrhea, persistent constipation, blood in the stools, persistent nausea or vomiting, vomiting blood, severe tenderness of the abdomen or pelvis, jaundice (yellowish discoloration of the skin) or swelling of the abdomen. A diagnosis for abdominal pain is often made by the doctor after obtaining a history and performing a physical exam. In other circumstances, diagnostic tests are used to confirm or to exclude a specific diagnosis. Many tests can be ordered for these purposes. They may include analysis of blood, urine and stool samples, x-rays of the abdomen, upper endoscopy, colonoscopy, and small bowel capsule endoscopy. The location of your pain can help narrow the list. But, it’s very difficult to know the cause of the abdominal pain solely by its location, even for an experienced doctor. Pain near your bellybutton can be related to a small intestine disorder or an inflammation of your appendix (appendicitis). It is uncommon to experience pain here. Gas can collect in the colon, under the spleen, and lead to pain. 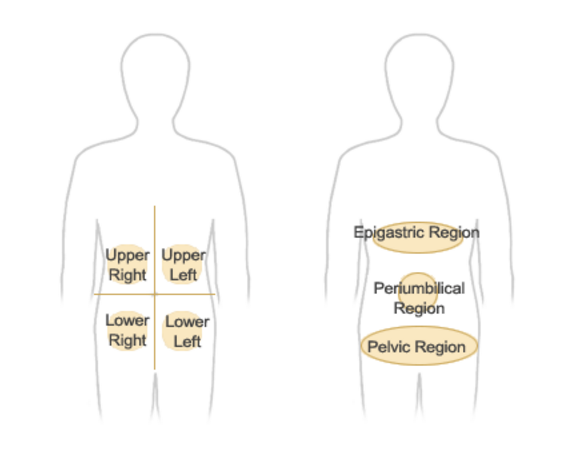 The epigastric area is located in the upper middle section of the abdomen. Stomach disorders such as ulcers and gastritis can cause pain in this region. Problems with the pancreas or gallbladder may also be associated with pain in this area. Pain in this area may signify a gallbladder problem. Occasionally, an inflamed pancreas, colon or duodenum can cause pain in this area. A less serious problem is gas that collects in the colon, under the liver. Pain here often suggests a problem in the lower colon. Possible causes include diverticulitis, inflammatory bowel disease (ulcerative colitis or Crohn’s disease), and severe constipation. In women, pain in this area may result from a ruptured ovarian cyst or pelvic inflammatory disease. Pain below the navel that spreads to either side may signify a colon disorder. Pain in this area may also be a symptom of kidney stones or a urinary tract infection. For women, pain in this area may also indicate pelvic inflammatory disease. Pain in this area can occur from appendicitis, Crohn’s disease, and in women, ovarian cyst or pelvic inflammatory bowel disease.